A 1000 point sisters of battle army. A Canoness leads the army into battle accompanied by a confessor with plasma gun and two crusaders. Two 10 woman sisters squads armed with power weapons heavy flamers make up the troop section. One of the Battle Sister squads has a flamer while the other has a storm bolter and blessed banner. A seraphim squad uses on of the fast attack slots. An immolator and Rhino gives the army some transport. A scratch build a forge world type exorcist forms the heavy support section along with a Retrilbutor squad. 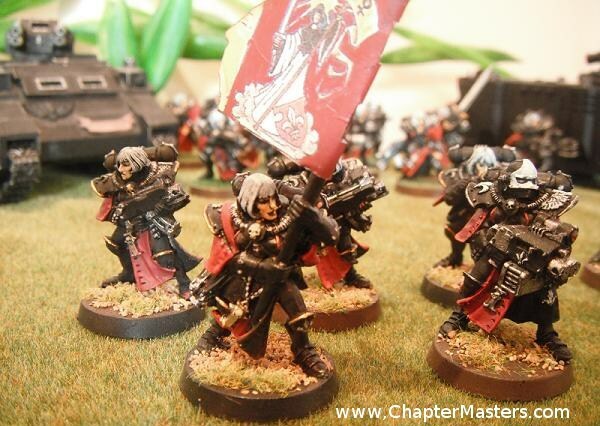 Finally an assassin sneaks around in the background, unfortunately no longer part of the Sisters of battle codex. This is the original 1994 MK1 Canoness model armed with a combi bolter flamer and a holy icon. The rules for the holy icon don’t appear in the current codex it must be some sort of power weapon? 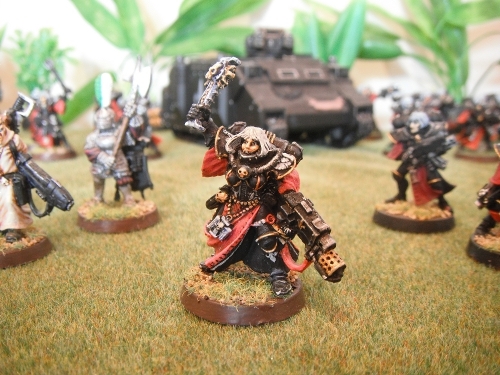 This is actually a preacher model, but the option to have a plasma gun has been removed for the latest sisters codex so he has now made it the rank of confessor. Armed with a bionic arm and box of bones which must be some sort of holy banner. This is the original Battle Sister box set. 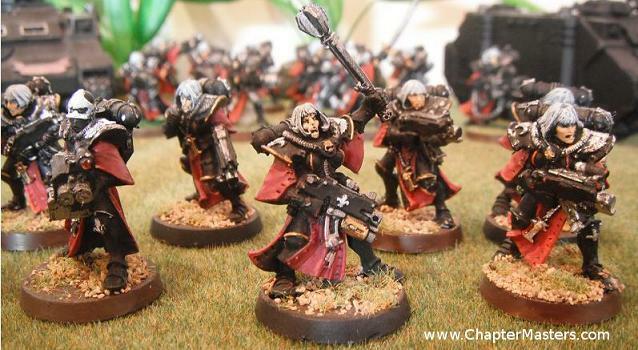 The sister superior is equipped with a bolter and power sword one sister came equip with a flamer. This Squad has taken a shameful 20 years to complete! The 1st 8 were bought and painted in the early 90s but were used as a command squad and Retrilbutors. 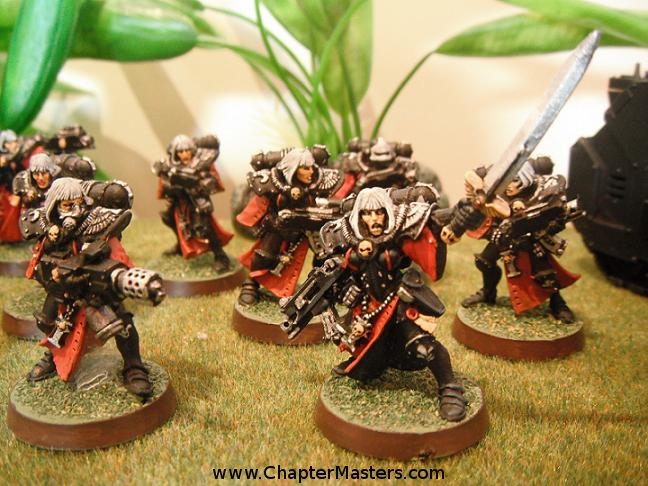 The last two were obtained when the Sisters Minidex came out as I needed a 2nd troop choice as the Arbites couldn’t fill this role any more. A Strom bolter and Heavy Flamer are used in this squad. The sister superior is armed with a Power Maul and Combi Bolter Plasma. 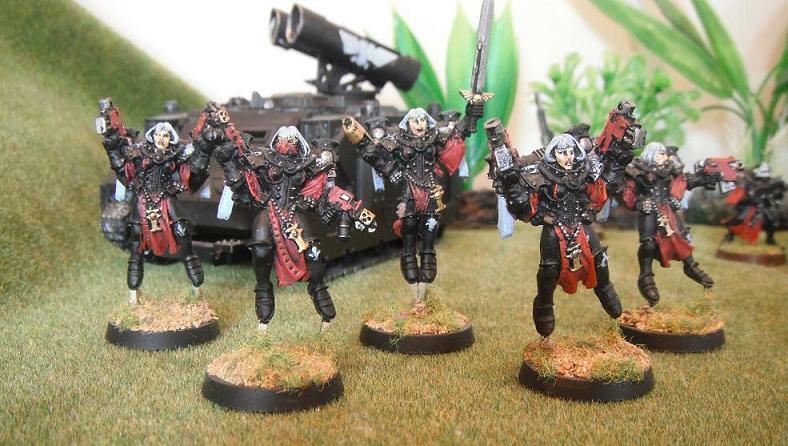 Battle Sisters Squad with Blessed Banner. This is a generic Imperial Rhino. I use in in my Sisters of Battle army but also as a Chaplin, Wolf Priest and Death Company Rhino in my Ultramarine, Space Wolves and Blood Angels army. The Eagle on the door is free hand. Only the major sides have been highlighted as It was “finished” in a spare 20 minutes before a game of 40k. These Seraphim are armed with a plasma pistol a power sword and twin linked flamers. Although having hit and run there strength and toughness of only three makes them better suited to short ranged fast moving fire support. 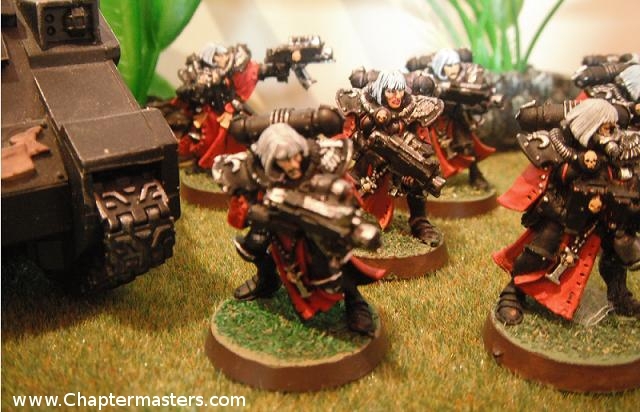 These Battle Sisters are armed with multi-melta’s to give medium ranged support to the rest of the army or if mounted in the immolator below that can be deployed forward on a flank of the battle field, encouraging tanks to steer clear. The Sisters of Battle Forge Immolator is from Forge World. Armed with twin link Multi Meltas it can advance to take out emermy tanks or just provide medium range support to the rest of the army. It’s transport capacity of 6 limits it to moving the Retrilbutors and Head Quarter units around the battle field. 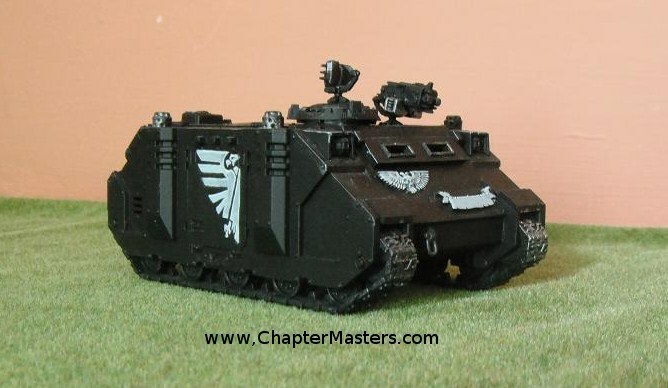 The Sisters of Battle Exorcist has been converted from a Razorback in the style of the Forge World model. The Exorcist Launchers have been made from Bamboo cane and with Cardboard attached to form the raised parts of the armour.